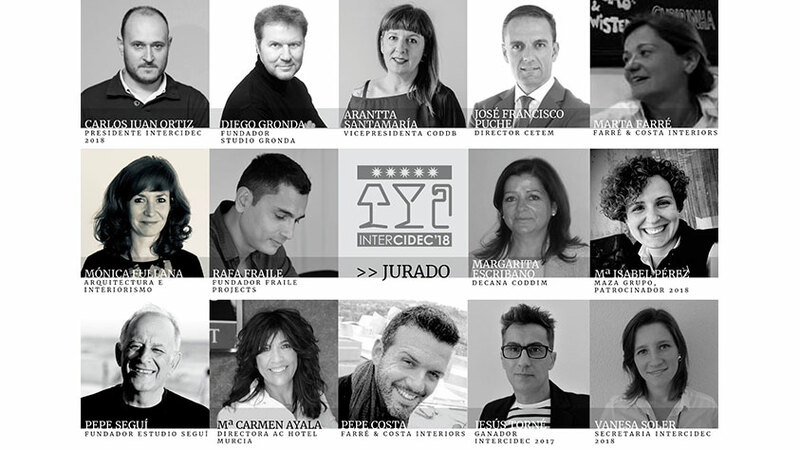 The jury of InterCIDEC 2018 is composed of top-level professionals related to the architecture, design and hospitality sector. They will choose the winners of the InterCIDEC third edition. InterCIDEC is run by the company Beltá & Frajumar, a manufacturer of furniture for the home since 1967. As well as contract projects where each product is manufactured exclusively for each work. Realizing the equipment for hotels, restaurants, apartments and common spaces. Mónica Fullana, Mónica Fullana Architecture and interior design. She currently runs her own studio based, mainly, in hospitality interior design. Hotel Robinson Playa Jandía in Fuerteventura (5*), Lio Restaurant and Pacha Group, in Ibiza, as examples. She has worked at Vila 13 Studio, Ibiza, as head of interior design. An architect by the school of Architect by the School of Architecture of Madrid (1971). He founded and directs Seguí Studio Architecture and planning since 1975 with headquarters in Málaga and Madrid. National prize of urbanism in 1985 and 1987, Prize “Europa Nostra” of Rehabilitation (Unesco) in 1986. International Prize “Gubbio” (Italian National Assocciation of historic centers) in 1997. Arantta Santamaría, vice president CODDB. Graduated in Interior Design at Escola Superior School of Design-Vitoria-Gasteiz current I.D. art. Vice President (Acting President) of the official School of Decorators and Interior Designers of Bizkaia. Currently is the school with most collegiate at the state level. International designer with more than 20 years of leadership in the architecture and interior design. He has collaborated with some of the most influence hospitality operators like; Virgin Hotels, Nobu Hospitality, Taj Hotels Resorts and Palaces, Ritz-Carlton Hotel Company, Starwood Hotels & Resorts Worldwide between others. Especialized in decoration, Superior Technical in interior design and graduated in interior architecture. Her professional career has been dedicated to the interior design, decoration, making projects and managing developments for different sectors. She is currently Dean of the Official school of decorators and interior designers of Madrid. Director of Hotel AC Murcia from 2002 to the present. Responsible for the hotel’s exploitation account, human resources management, contracting, income management, expense management, revenue manager, training and quality manager, customer service, budgeting, clients, events organization, etc. Spaces designer and teacher of arts and design. Higher degree in interior design from the school of art of Seville and master of pedagogy in visual and visual arts from the University of Alcalá de Henares. He has made product design, creating different pieces for his own projects. Higher Engineer on Telecommunications by the Polytechnic University of Valencia. He started his professional career as a development engineer. Currently, he is the director of CETEM since 2005. He started Industrial Technical Engineer at UPC and lately, he graduated in Technical Architecture at the Polytechnic University School of Barcelona. Combining university training with working life in the GTT Percentage Engineering Office. In 2003 he moved to Ibiza to start the profession of Technical Architect at Urcoisa, Palladium Hotel Group belonging to Empresas Matutes Group. Mª Isabel Pérez, Maza Group. Architect at the Alicante University since 2005 and doctor at architecture since 2011. Partner of MAZA Lab Studio. Currently, she combines his professional Career with teaching. She is a professor in the Department of Architectural Constructions of the University of Alicante. She is also president of the Commission of Final Project of Degree in Architecture at the Catholic University of San Antonio, Murcia (UCAM). She studied in the Fine Arts University of Barcelona. Along Her degree, she started to have contact with interior designers and architects. And she studied the doctorate of urban regeneration and large format sculpture. Then she started to travel around the world and it was in Central America, where she discovered her passion for interior design. Interior designer, specialized in commercial spaces design. When he graduated in Tourism in 2005, he started to work in some commercial companies before getting involved in the Design world. In 2006 she moved to Palma de Mallorca, where he combines his interior design studies with the realization of projects for some companies. Then he moved to Barcelona in 2008 to finish his post-grade and realize some hospitality projects and retail in “Ramón Malvar Architects” Studio. Eventually, he decided to come back to his island, Palma de Mallorca, in 2010, where he collaborates with local hospitality, decoration and property sector companies constantly. Carlos Juan Ortíz, Jury President. Partner and part of the head office in Belta & Frajumar company. He studied finance and administration higher degree, joining the company in 1999, making different job around the company. Currently, he is the production, quality, R+D, and design departments manager. He has managed several projects like Hard Rock and Ushuaïa in Ibiza, for Palladium and “Círculo Autograph Collection” by AC Marriott in Madrid.